This was the last play on this trip to London. 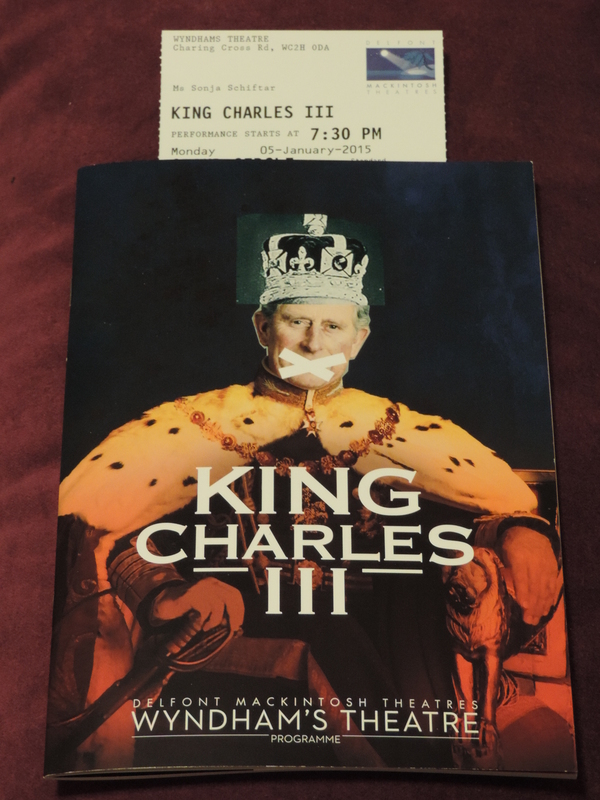 Beforehand, we joked that we managed an entire five days without seeing a Shakespeare play, but after having seen ‘Future History Play’ King Charles III, I have to say we kind of did. There’s some Lear (even quoted by Duchess Kate) and Richard II in there as well as elements of original practice. Add political intrigue, family issues, two very different sons and a ghost, et voilà. In a nutshell, Charles refuses to sign off on a new law that practically makes privacy a thing of the past. While he is legally absolutely within his rights, this unusual decision is used by Prime Minister and leader of the opposition to rile up the public against the royal family and question the monarchy. The quick escalation and poor handling of the situation pits family members against each other as well. 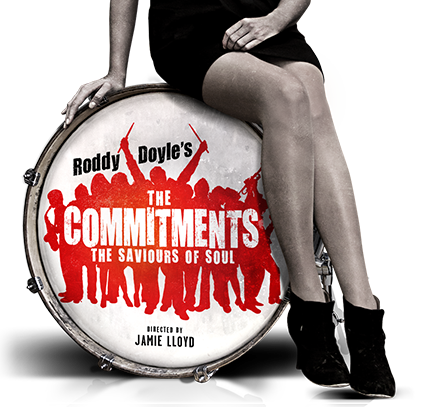 As if there weren’t enough ‘well meaning’ meddlers already, Diana’s conniving ghost jumps into the fray as well. Charles is portrayed as a conscientious ruler and loving father, being unable to sign a law he finds alarming, supporting Harry when his activist commoner girlfriend is dragged through the mud by the media and not turning his back on William when it would have been understandable to a certain extent. Harry is the other person in the play who gets off lightly. He tries to live as normal a life as possible and make his own decisions only to realise he’s just a pawn on the royal chess board after all. I can’t say much about the other members of the royal family without giving away too much of the plot, but they were all recognisable and very well played. Mannerisms, body language and speech patterns were very close to their ‘templates’, while not overdone to the point of being Spitting Image figures but always real and flawed persons (ghost notwithstanding of course). The scene that most reminded me of Richard II (For God’s sake, let us sit upon the ground/And tell sad stories of the death of kings;) when Charles still thinks making tea and having a conversation with William can actually change something was heartbreaking. Harry’s girlfriend who started out as something akin to ‘the voice of the people’ unfortunately turned into a stereotypical ‘hear me roar’ girl who instead of evolving with the new situation she finds herself in just came across as petulant. A more interesting character is the kebab vendor who gets philosophical about the royal family with Harry whom he does not recognise, reminiscent of Henry V.
The unsettling and scary thing about the play is that it’s all entirely possible. Let’s hope there won’t be tanks guarding Buckingham Palace any time soon.